An art project. A tiny way to make the world a kinder, gentler, happier place. A bunch of paper birds. In Japan, there is a widely held belief that anyone who can fold 1000 paper cranes will be granted a wish, be it for happiness, recovery from illness, or 1000 years of prosperity. 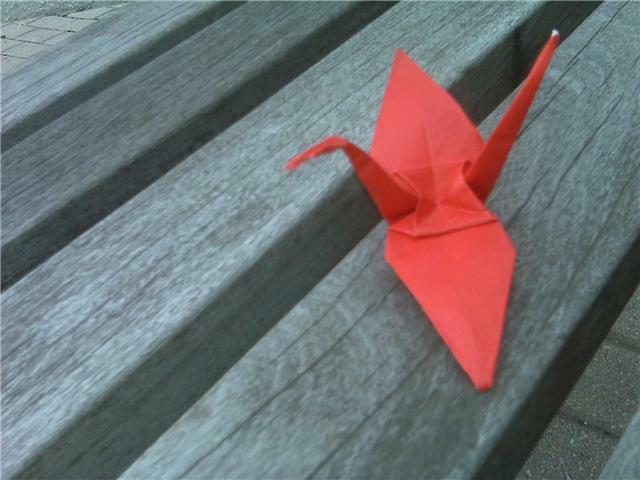 Similarly, there is an oft-told tale of a young girl named Sadoko Sasaki who, when stricken with cancer as a result of the nuclear weapons used on Japan, attempted (but ultimately failed) to fold 1000 paper cranes to cure herself. And so I thought, with the world in the state it is in today, why not do what I could to put some good in the world, to help myself and other focus on the positive and possible? Since I am neither independently wealthy and nor an omnipotent being, paper cranes it is. In each crane (which is painstakingly folded and left for others to find around the City), I write an inspirational message (as noted on the blog post) so that the crane itself becomes something of a message in a bottle (sans bottle), a fortune cookie (sans cookie), or even a prayer. Maybe this project seems hokey/cheesy/pointless to you, dear reader (and/or the discoverer of the crane). If so, feel free to view this as nothing but an art project – the small insertion of art in the everyday. Above all, feel free to rescue one of these red paper cranes from the wild should you come upon one! They make for some lovely shelf decorations. I actually started this project over six years ago – a different time in many ways with a different type of turmoil. With all that is going on in the world in the summer of 2016 — terrorism, the never-ending vicious lead-up to the US election, the remnants of the economic downturn, I thought it would be a good time to reboot. So I’m wiping the slate clean and starting from zero – re-writing, refolding, redistributing.